Can’t Historians Predict the Future? Nostradamus could have been a policy wonk. My favorite not-so-witty quip during my public talks is “historians are always asked to predict the future.” It usually gets a chuckle. I say it as a cop-out when someone asks me about anything controversial: the future of nuclear power, the future face of warfare, or whether Iran will eventually have nuclear weapons. 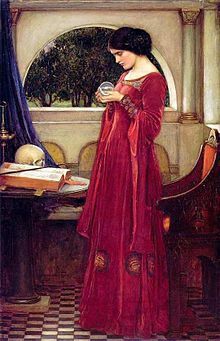 I have lots of musings and predictions, but unfortunately no crystal ball. Really, how could I possibly know these things? But Arming Mother Nature, my forthcoming book, is filled with human dreams, modeling, and gaming about the war-that-wasn’t with the Soviet Union and the future of the earth itself. When I talk about the ideas born of the Cold War, it’s quite natural to take the story one step further, into the future. Here’s a question: will nuclear weapons be sometime used in the future? First of all, the future is a long time. So I’m pretty confident that “yes” is the answer. But the question is usually more circumscribed: will the United States use nuclear weapons? I kind of doubt it. Or, will another country use them – say, a smaller country in a volatile region rife with civil wars, revolutions, and religious conflict? The answer is, annoyingly: it depends. Will the IAEA inspection regime be enough to keep upstart nations from building nuclear bombs? Again: it depends. The more interesting questions for a historian, in these examples, are: why hasn’t the United States used nuclear weapons since 1945, and are those reasons likely to change in the coming years? Or, what has motivated small countries to pursue nuclear weapons, and are those reasons likely to change? And last, what worldviews led to the creation of the IAEA in 1957 and Non-Proliferation Treaty just over a decade later, and were they sound—then or now? The poor cousin to the predictive, Nostradamus-like question is the policy-relevant one. Historians are more comfortable with this one because it helps to show that history is relevant to our times. The above paragraph is framed in a history-as-policy fashion. When I was in grad school I remember thinking that many of my comrades-in-arms really wished they worked for the State Department, and that they harbored secret ambitions of using history to inform policy decisions. I remember being at the State Department about a decade ago for a meeting of foreign relations historians, and Richard Armitage (the politician, not the actor) gave a keynote at Foggy Bottom. He assured us that policy makers do read history and that the Office of the Historian was an extremely important part of the State Department. I had a similar experience at a Naval History Symposium a few years before that, when the folks at the Naval Historical Center showed us how “relevant” they were to operations. I’m pretty convinced at this point that this relevance is, at best, limited to a few people. As to who they are, your guess is as good as mine. Evidently President Obama carried around Team of Rivals with him prior to his first term, so that’s something. Don’t get me wrong, the work of the State Department Office of the Historian is amazing, and I have used their FRUS volumes for all of my books. Real historians, doing real research, producing genuinely useful primary source materials. But frankly I’m just kind of amazed that they manage to stay in business. Good for them. I’d like to say, however, that trying first to be relevant to policy does not produce the most reliable history. In fact, strangely enough, the deeper historians get into their subjects, the less excited they might feel about policy advice. I suppose I should just speak for myself on this. After years of writing about science, technology, and the Cold War, I can think of lots of policy recommendations, but they are based on an array of variables, a variety of perspectives, and a smorgasbord of aims. How many of these aims do I personally share? For example, I can imagine what the Henry Kissinger of 1974 would do about Iran. I can imagine what J. Robert Oppenheimer would say about whether certain technologies ought to be pursued. I can give you a Ronald Reagan-esque take on environmental challenges, and I can tell you exactly what Barry Commoner would think of all of our supposed technological fixes. Or, if you want to get more tricky, I can think of what to do about Iran from the point of view of American military power, from the point of view of maintaining the global status quo, for maintaining the primacy of the G8, from the point of view of Israel’s peace of mind, from the point of view of Iran’s internal politics… the list goes on. There’s no right move that I can provide, to inform the chess match, unless I stop being a historian and explicitly adopt a policy agenda of my own, i.e. to pick white or black, to continue the chess metaphor. Which plenty of people do, I suppose. But it’s pitiful as scholarship. Frankly, the cynical historian might finally conclude that the world he or she would like to see is extremely unlikely to come to pass, given demonstrated human tendencies, our willingness to forget things, and our ingrained pursuit of self and national interest. But now I’m starting to sound predictive. And that’s how we loop back to Nostradamus. It may be that historians do implicitly try to predict the future, even while blithely dismissing questions from the audience about what will happen in the future. Historical perspective has a disturbing element to it that runs against the grain. As much as it makes you an informed citizen, it also makes you an informed human, and perhaps even an informed inhabitant of the earth, and it can drive you far, far away from contemporary politics. Where should historians send policy-relevant scholarship? And here I thought you were going to predict some Visioneers. But yes, it is similar to that special knowledge, and the role of specialists in public policy. But ever since Walt Rostow ruined things for us by applying economic history to the Vietnam War, it seems like nobody wants to ask a historian to be “on top.” We’re just “on tap,” and barely that.